So the observant of you will see that the front of my jacket has now been covered in rows of pretty basting stitches….. The reason, of course, is to hold the interfacing in place. Now a tailored jacket has a multitude of interfacing components, adding structure, shape and weight. 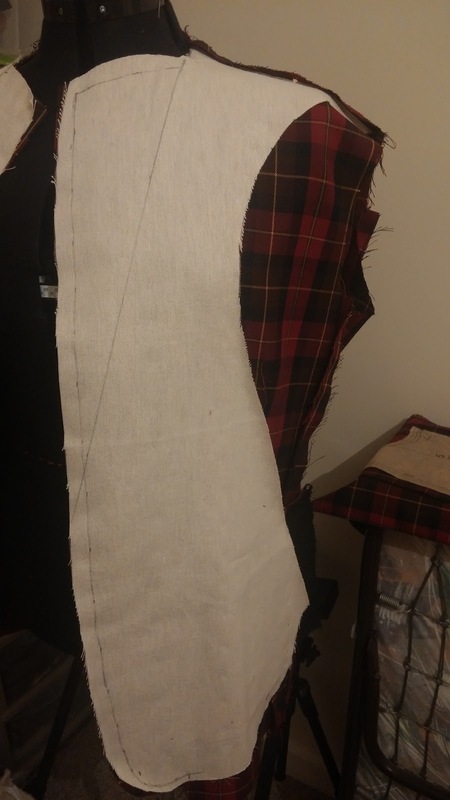 I am not a tailor, just an amateur sewist who likes to make tailored things, so I will show you my (easier) method of getting the tailored look. 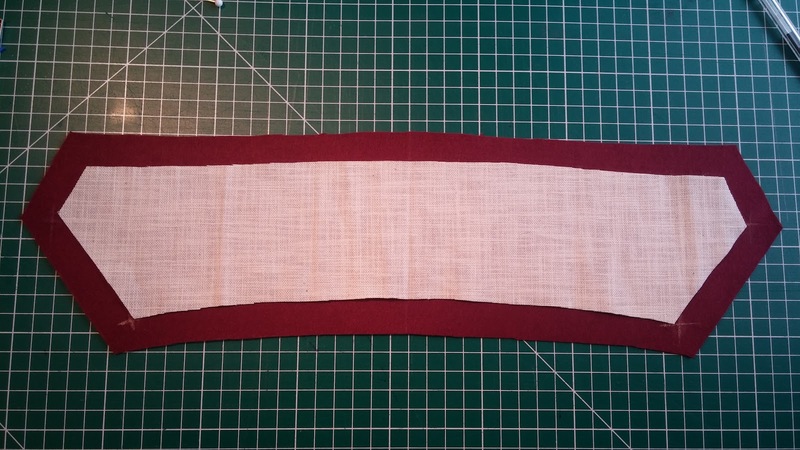 Cut a nice piece of woven canvas fabric: (nice soft and flexible). 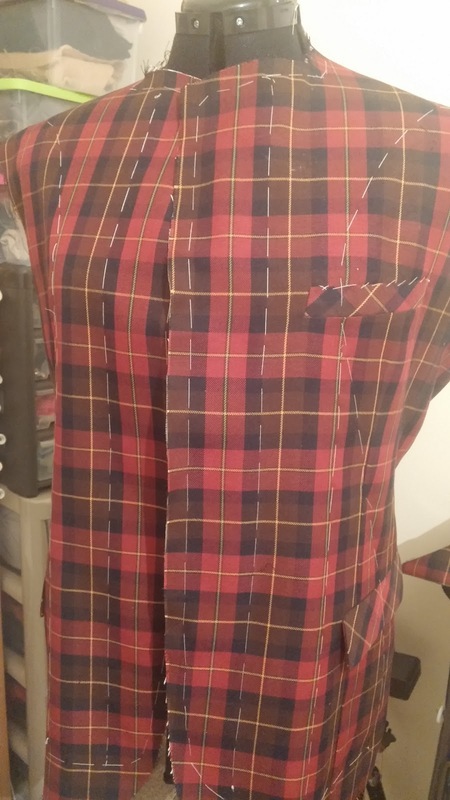 Use the front pattern piece as a guide but cut away from shoulder, through breast to hem (make a nice gentle curve). Carefully baste the canvas to the inside of the front fabric. Take your time and use loose unequal basting stitches. Remember it needs to conform to the shape of the wearer! The canvas will ‘float’ between the fabric and lining. It will only be held to the structure along the front edge of the jacket and across the shoulders. So go ahead and sew the canvas to the seam of the front shoulder. I use a nice small hand sewn backstitch. 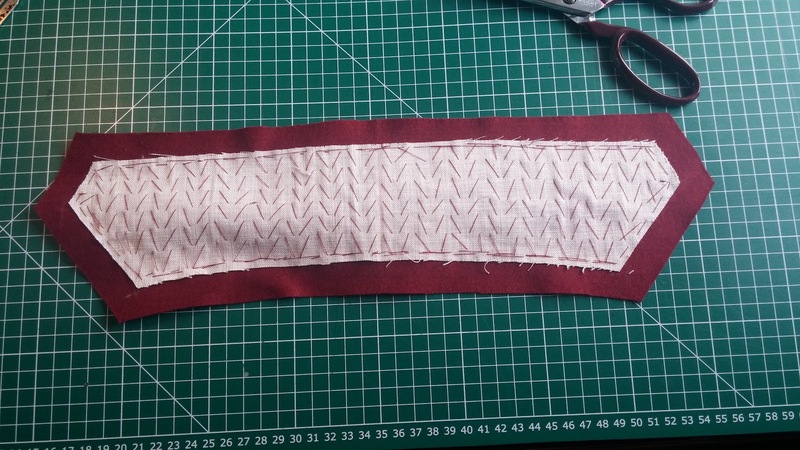 In the last post I discussed the merits of hand stitching and I am going to introduce you to another hand sewn stitch….. The Pad stitch. 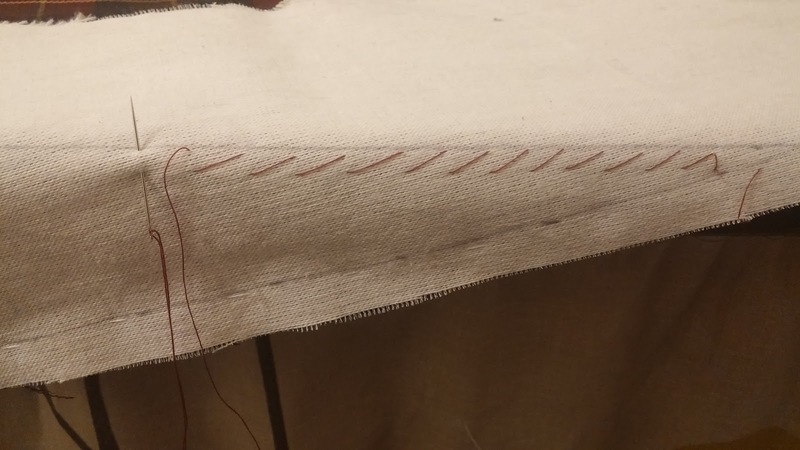 This is a stitch you may not have come across but is invaluable in many tailored items. 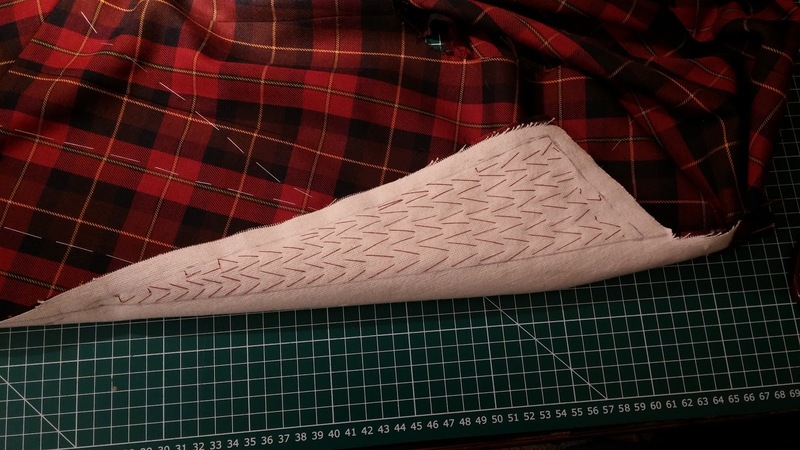 The pad stitch is normally used to hold interfacing material to the fabric and allow shape to be created. In a jacket, for example there will normally be one or more layers of interfacing material to give shape to the front, lapels and collar. 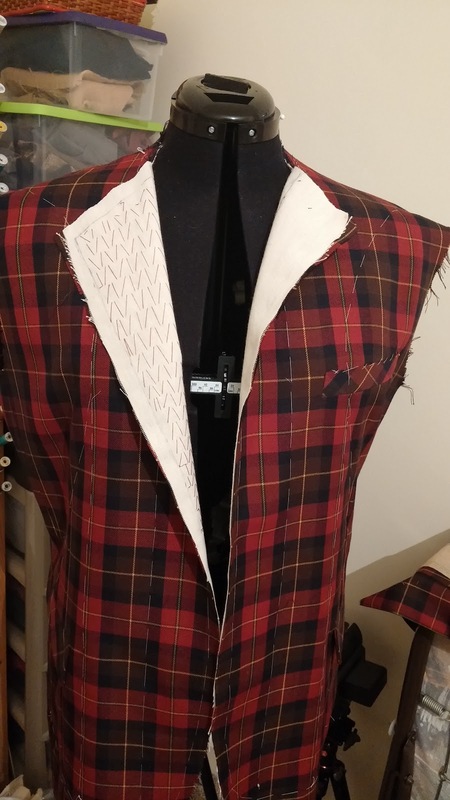 The lapels and collar in particular would be Pad stitched allowing you to join the layers of fabric and interfacing, creating shape and, if done well, you won’t even notice the stitches. 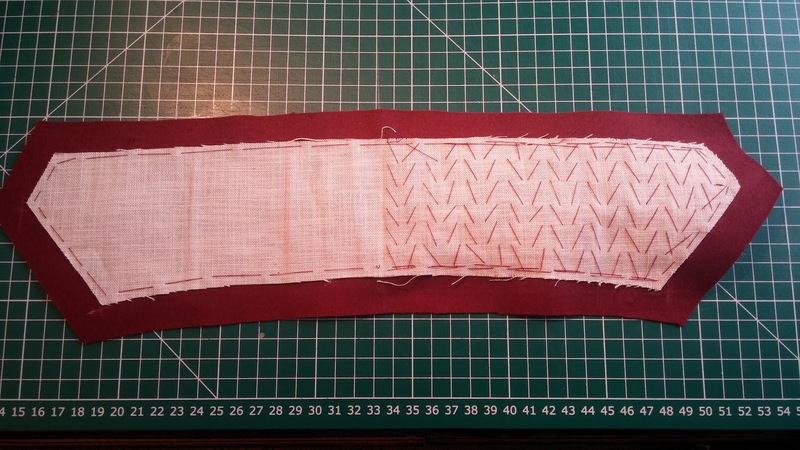 The stitch pattern forms a diagonal with the needle passing through the fabric parallel to the previous. Here I have started at the top and worked down. The needle is taking around 1cm through the fabric, just catching the layer below. 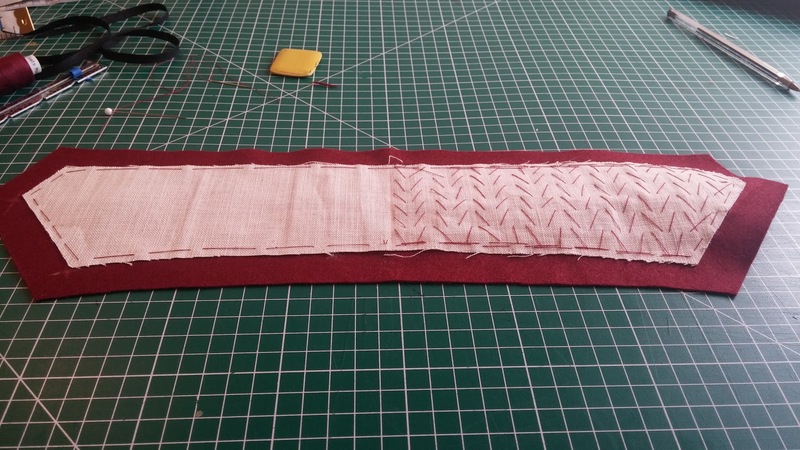 The next row of Pad stitches are then worked from bottom to top in the same manner. Repeat until the Pad stitched area is complete. Now you drew a nice triangle on your canvas at the top of the lapel. This will be Pad stitched. Pick a suitable colour thread to be as inconspicuous as possible on the fabric. After practice your stitches will not even show but don’t worry too much because these stitches will be hidden when the lapel is rolled over. 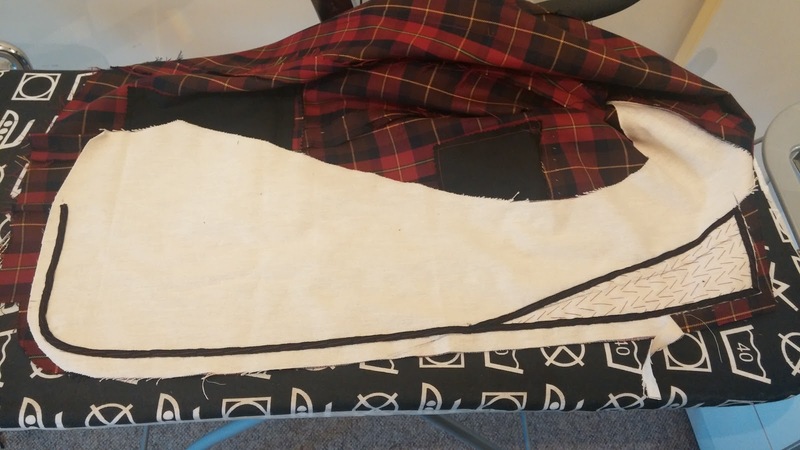 The best way to start is to lay the jacket down on a table with the lapel roll line you drew along the edge of the table. Stitch 2 rows with the jacket hanging over the edge of the table. 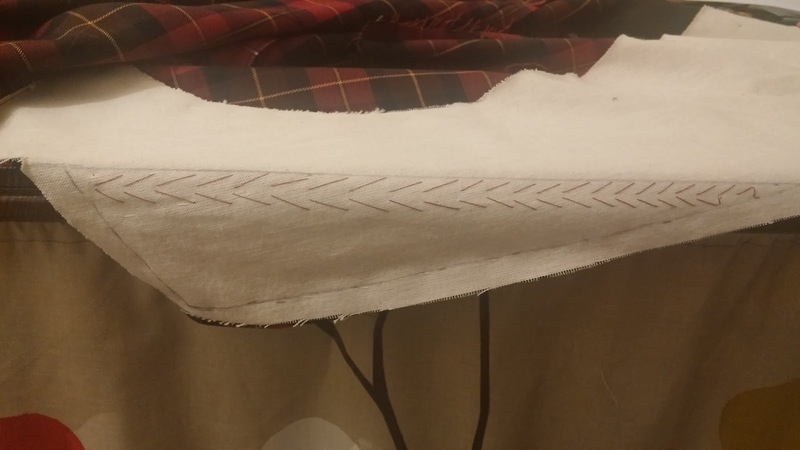 Continue to Pad stitch until you fill the triangle. I will say again…don’t worry about how perfect these stitches are! Here you can see the left (RHS of jacket) sits beautifully against the jacket (Pad stitched side) whilst the other side flaps around and curls over! 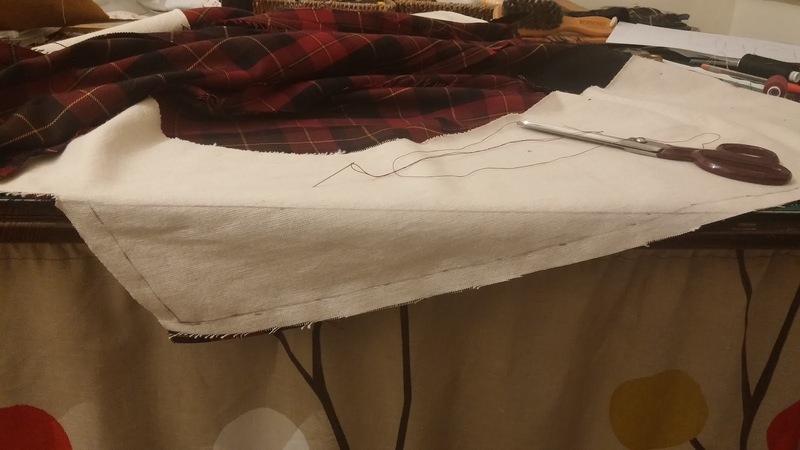 The tape is sewn (again by hand) down the roll line (keep the tape edge against the inside of the line you drew) and around the lapel (again with the tape edge on the inside of the line). Repeat for other side. 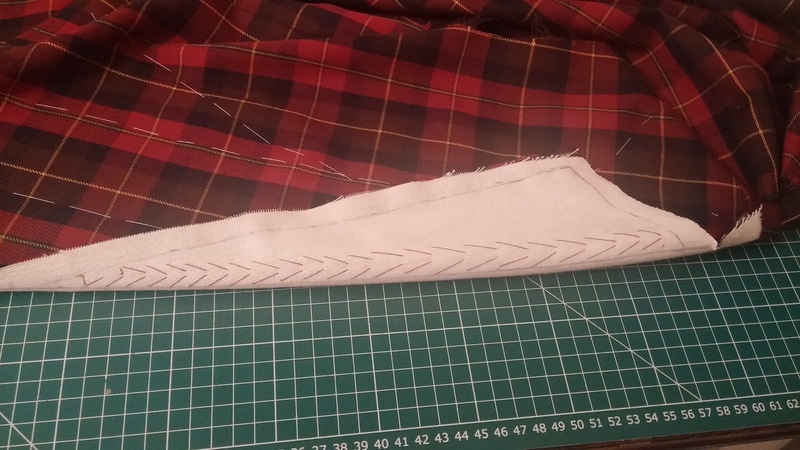 Continue sewing the tape along the front seam line around the curve at the hem and along for a few inches (Along hem line). 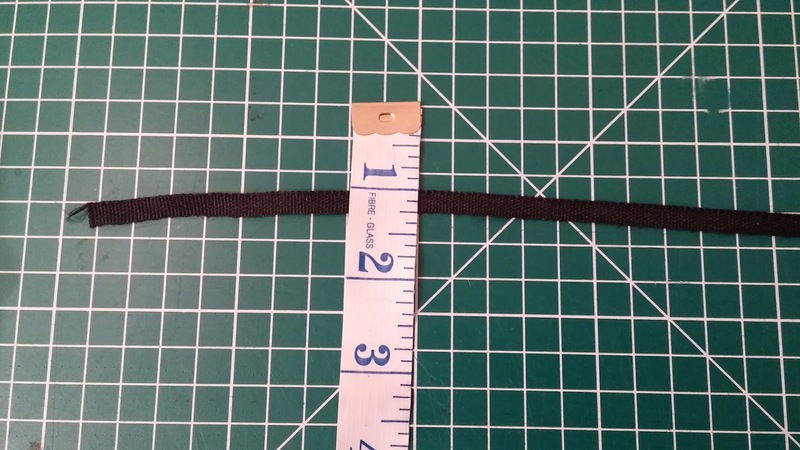 Leave plenty of ease in the tape as you go around the hem curve. Try to sew the tape to the canvas only, not through to the fabric. Trim away the canvas to the tape line (we don’t want to add unnecessary bulk to the seams) and voila! 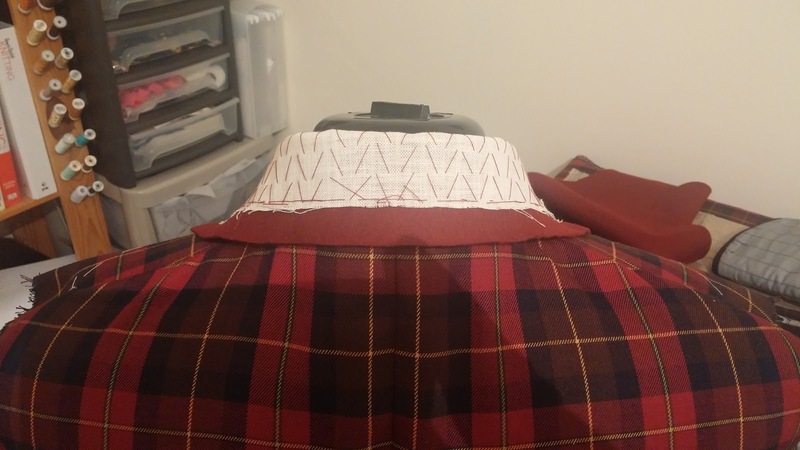 Now it is time for the collar. The jacket collar consists of an Under-collar and Upper-collar. The Under-collar is attached to the jacket whereas the Upper-collar is attached to the facings, which are then attached to the jacket! Confused yet? 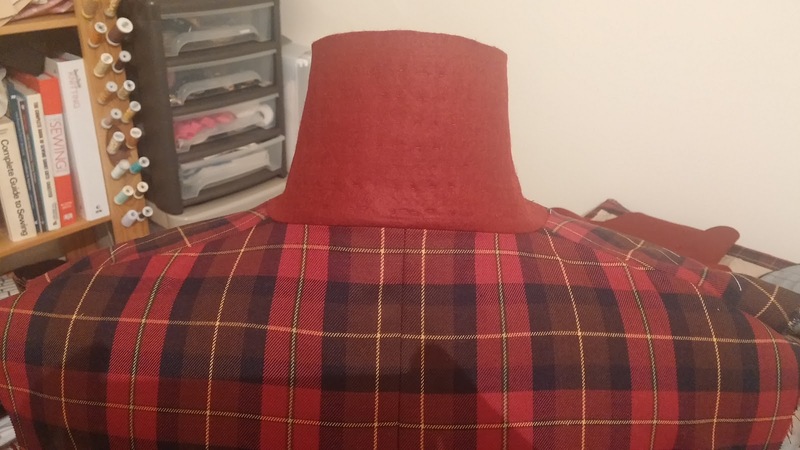 So Under-collar….I have cut my Under-collar in Melton fabric: A wool that feels like felt. It is quite expensive and you don’t need much but I happened to have some spare. You can always use good quality felt which is much cheaper. To be honest I have used felt before without any problems. Cut the same in canvas material and cut off the seam allowance. Baste to wrong side of Under-collar. Now Pad stitch time again! Start at the centre and work towards the tip. Now repeat for the other side and complete. Now I am not going into detail as to how you should join the Under-collar to the jacket. There are a multitude of different ways so follow your pattern. Just check everything ten times before sewing! If it looks wrong then it probably is! Measure everything and take your time. 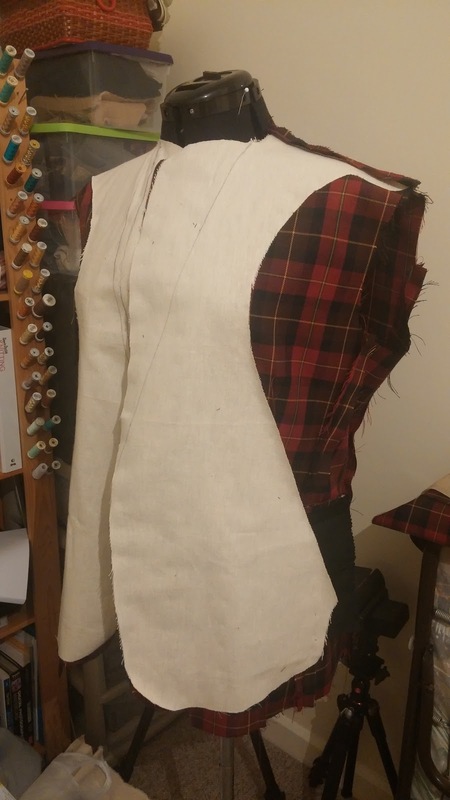 Under-collar attached, seams clipped and trimmed and pressed. Well thats all for today. Hope your #Blazerof2016 is going well? 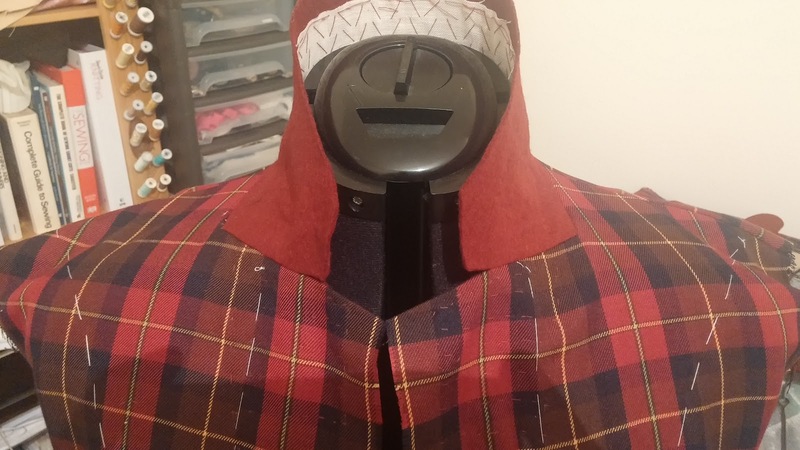 Next we will tackle the facings, Upper-collar and hem. Fabulously concise instructions Jamie, that has made a lot more comfortable about trying this challenge. Just got to source the canvas and the twill tape. Bias Bespoke is in NYC, and RAW in the UK. Thew are other places too. I hope this is helpful. Enjoy your project. I'm so looking forward to doing some pad stitching! It makes such a difference. 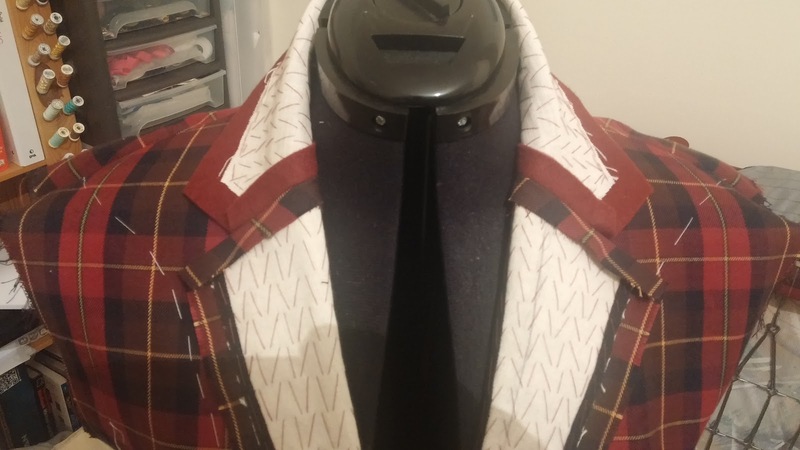 This is going to be one amazing blazer, Mr Kemp! I too enjoy your blog. I'm going to follow this sew along, (and after March, hopefully be able to participate). Your posts are well documented, simple and interestingly, harmonize with what professional tailors do and teach. 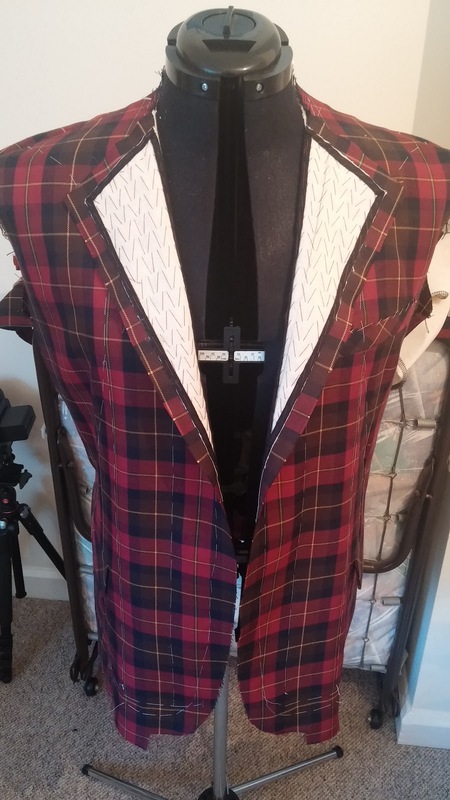 (Regarding building shape into the lapels, tailors sometimes make wooden convex pressing forms that they lay the front, canvas, horsehair chest piece, and domette onto to form the shape of the chest and shoulder area while padstitching). 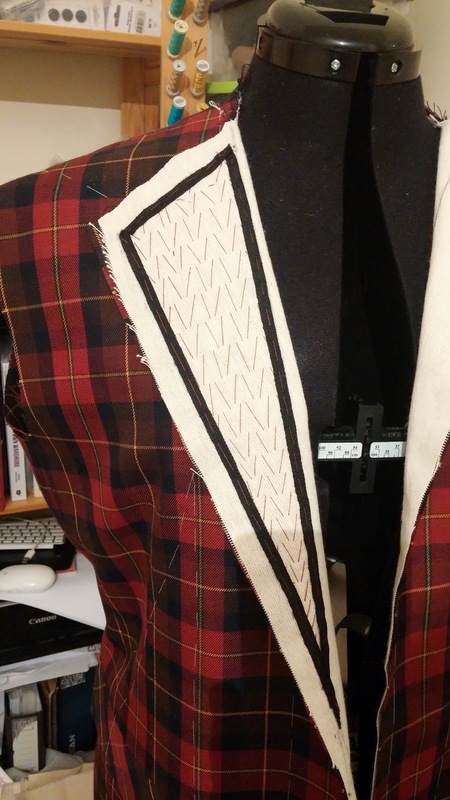 There's an on-line tailoring course taught by Andrew Ramroop, and it's fantastic. Your blog is too. I'm planning a 3 piece suit, so hopefully time will allow me to get it done. Thanks for posting this.